However the mere act of developing products or services or processes which do not have potential for commercialization or undifferentiated products or services or processes or products or services or processes with no or limited incremental value for customers or workflow would not be considered as eligible business. 3. How to get recognized as a Start-up? ➢ Have a patent granted by the Indian Patent and Trademark Office in areas affiliated with the nature of business being promoted. 1. 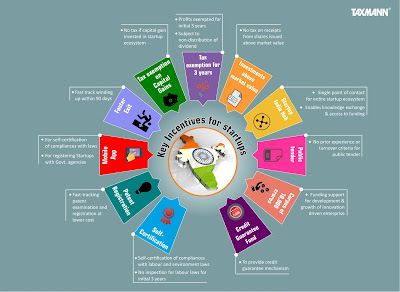 Self-Certification: Start-ups would be allowed self-certification of compliances with certain labour laws and environment laws so as to reduce the regulatory burden. Further in case of the labour laws, no inspections will be conducted for initial period of 3 years. 2. Patent registration at lower cost: Patent applications of Start-ups shall be fast tracked for examination and disposal, so that they can realize the value of their IPR at the earliest possible. A Panel of facilitators will be empanelled to assist in filing of IP applications. The Government shall bear the entire fees of the facilitators and the Start-up shall bear the cost of only statutory fees. Further, Start-ups shall be provided 80% rebate in filing of patents vis-à-vis other companies. a) Registering Start-ups with relevant agencies of Government. b) Tracking the status of registration application and downloading of the registration certificate. c) Filing for compliances and obtaining information on various clearances and approval required. d) Applying for various schemes being undertaken under the Start-up India Action Plan. The Mobile App shall be made available from April 1, 2016 on all leading mobile/ smart devices' platforms. 4. Faster exit for Start-ups: In terms of the Insolvency and Bankruptcy Bill 2015, Start-ups with simple debt structures or those meeting such criteria as may be specified may be wound up within a period of 90 days from making of an application for winding up on a fast track basis. 5. Exemption if capital gain is invested in start-ups: Exemption shall be given in respect of a capital gain which is invested in the Start-up ecosystem. 6. Tax exemption for 3 years: Profits of Start-up initiatives shall be exempted from income-tax for a period of 3 years. The exemption shall be available subject to non-distribution of dividend by the Start-up. A Start-up shall be eligible for tax benefits only after it has obtained certification from the Inter-Ministerial Board, setup for such purpose. 7. Investments in start-ups above FMV is not taxable: Consideration received by a Start-ups for issuing shares at a price higher than its Fair Market Value would not be taxable as income from other Sources in the hands of recipient under section 56(2)(viib) of the Income-tax Act. 9. Relaxation in Public tender: Typically whenever a tender is floated by a Government entity or by a PSU, a very often eligibility condition specifies either "prior experience/turnover". Such a stipulation prohibits/impedes Start-ups from participating in such tenders. In order to promote Start-ups, Government shall exempt Start-ups (in the manufacturing sector) from the criteria of "prior experience/turnover" for filing of public tenders. 10. Creating corpus of Rs. 10,000 crore: Government will set up a fund with an initial corpus of Rs. 2,500 crore and a total corpus of Rs. 10,000 crore over a period 4 years (i.e. Rs. 2,500 crore per year). The Fund will be in the nature of fund of funds, which means that it will not invest directly into Start-ups, but shall participate in the capital of SEBI registered Venture Funds. 11. Credit Guarantee fund: Debt funding to Start-ups is also perceived as high risk area and to encourage Banks and other Lenders to provide Venture Debts to Start-ups, Credit guarantee mechanism through National Credit Guarantee Trust Company (NCGTC)/ SIDBI is being envisaged with a budgetary Corpus of INR 500 crore per year for the next four years. * DIPP (Department of Industrial Policy and Promotion) may publish a 'negative' list of funds which are not eligible for this initiative.